When I looked in the mirror I saw a face that seemed younger than my calendar age. Okay, I had courted the sun for years without benefit of sunscreen, but when I understood the damage I was doing I had repented. I started using SPFs of 30 to 40, as well as excellent anti-aging products, all with good results. But when I looked at my hands, they reflected every hour I spent in the sun—and every calendar year that had passed. That’s the reality shared by a generation of women who didn’t understand that hands need as much TLC as face—and perhaps even more because hands age even more quickly than the face. The skin on the back of your hand is much thinner than that on your face. So when normal aging is compounded by years of sun damage, when collagen and elastin fibers begin to break down, hands look…old. 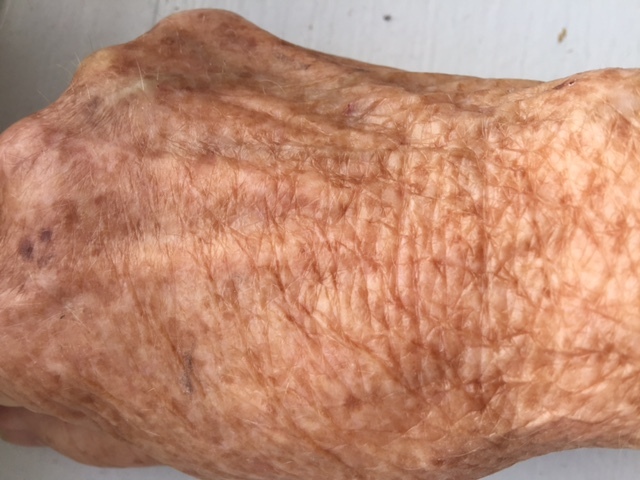 This is what a hand can look like after years of sun damage and the passage of time. 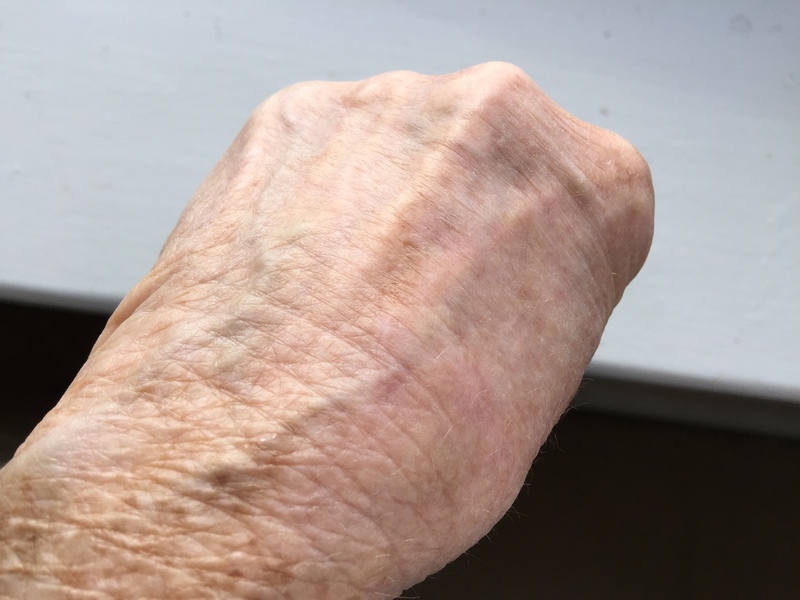 To emphasize that message, aging hands are punctuated by the brown spots that used to be called “liver spots” and which my dermatologist euphemistically calls “maturity spots.” These are the virtually inevitable results, not of age, but of exposure to the sun. That’s the bad news. The good news is that there are steps you can take to make your hands more attractive. There are products that can be applied topically and, when used regularly for an extended period, diminish the signs of aging. These products contain growth factors, generally plant derivatives, and are said to promote new collagen formation. The cost starts at about $30. Less expensive are products to keep the hands moisturized and hydrated. Women of all ages should be applying rich creams to their hands, especially at night, to combat dryness and roughness. If you use nail polish, it’s best to avoid the dark brown or other dramatic colors that tend to highlight the signs of age and to choose softer shades instead. And finally, there are the dermatological procedures that can make a major difference in the appearance of your hands. As loss of subcutaneous fat on the hands results in thinner hand skin and more prominent veins, medical fillers, the same ones used to fill out wrinkles on your face, are the most popular method for replacing the volume that has been lost. Various laser treatments can be used to soften or remove brown spots and to resurface the skin on the back of the hand. These treatments generally cause minimal discomfort and require no down time; they are very different from the lasers used years ago, which would severely wound the skin, require extended periods of healing and carried the risk of complications. Today’s fractional lasers administer a few “zaps” that create tiny pinholes in the skin that trigger the production of collagen and elastin. After examining my hands and listening to my expectations, Dr. Schwartz explained that he would be performing a combination lasering, using the profractional laser along with a BBL treatment, a light treatment that sends light energy into the skin, to boost the body’s natural ability to combat the signs of aging. There would be minimal discomfort and no down time. After applying a numbing gel on my hands and allowing it sufficient time to do its job, the doctor began the treatment, slowly and patiently checking regularly to see if I needed to stop. There was no pain, just a feeling of pinpricks from the laser “zaps.” The laser proceeded just past my wrists so that there would not be a dramatic demarcation between the treated and untreated areas. When the treatment was complete, Dr.Schwartz explained that over a period of days (this varies from individual to individual) there would be some scabbing on my hands and that there would sloughing of old skin before the fresh new skin would be revealed and that the effects of the treatment would continue, perhaps for weeks. Though my hands become quite unattractive for a while due to the scabbing and sloughing, there was no real discomfort. And gradually, as the fresh new skin was revealed, it was firm and tight and most of the brown spots had either disappeared or were considerably lightened. This is the result of one treatment. Though the skin on the hand is far from “perfect,” it is more “natural” than it would be on a hand that shows no signs of aging at all. Though I had been advised that more than one treatment is necessary for optimal results, I felt that the improvement that had already been accomplished was more than enough. Hands that were too perfect just didn’t seem to match my general appearance. Furthermore, the changes that had been achieved with new collagen and elastin would be long-lasting, subject, of course, to continued aging and the care I took with sun exposure. The average cost of laser skin resurfacing, depending on geographical location and type of practice, runs about $750 per pair of hands, per treatment. In addition to his New York practice, Dr. Schwartz is an Assistant Professor of Plastic Surgery at Weill Medical College of Cornell University. Thanks to his long-term hospital appointments at New York Presbyterian Hospital-Weill Cornell Medical Center (rated the best hospital in New York by US News & World Report), Hospital for Special Surgery and Lenox Hill Hospital, Dr. Schwartz is able to offer patients the combination of expert surgical skill and access to the best hospitals in the country. He also operates at his office facility which is fully accredited by the American Association for Accreditation of Ambulatory Surgical Facilities. (AAAASF).